Wow! 100 posts. Who knew I had it in me? Well you did - my three loyal readers. You did! Except, you are not three loyal readers anymore, are you? Turns out, that despite my best efforts otherwise, you are now hundreds of readers EACH day. Which blows my mind and instantly fills me with guilt. I should be writing more. I should be decorating more. MORE MORE MORE! But as I was just about to go out for a run - my 4th different kind of workout this week - I realized that I am, in fact, a dabbler. One of the things that makes me the most happy in life is doing all different things at the same time. Nothing depresses me more than focusing on one thing or getting stuck in a routine. So it makes perfect sense that this week, I went to two different gyms, went to two different Pure Barre classes, worked out on an elliptical in my basement and am now about to run on the bike trail near our house. I know..I know. You are SO impressed with my new obsession with working out (it's really just catching up from when I had my daughter 10 YEARS AGO) but the random nature of my fitness interest proves that I am in fact a dabbler. Not that this makes me noncommittal. I am in fact 100% committed to working out (for now anyway) but I am not bound by any one way of doing it...and that makes me a happy girl. When I see on my handy dandy Google analytics that there are 300 people a day visiting this blog (I know...it's probably a tiny number in the real world of blogging), my natural instinct is to throw myself into this blog and into decorating and turn this into something. Something that makes me money, something that gets me recognized, something that helps friends and clients turn their houses into showpieces. And then I start to fret about my own house and all the rooms that still need to be done. And then I start to have a panic attack and just forget the whole thing. Same thing for my "real" career. Last year when I decided to quit the whole caboodle and stay home and focus 100% on being a mom, I literally got chills up and down my spine. The idea that I would be labeled as just one thing - in my own mind and in others - terrified me. So I didn't quit completely. I decided to dabble! Dabble in the job that I had done full time for so many years meant working about 10 hours a week. And guess what? I have never been happier. I am productive when I am working. I feel valued and useful and then when I walk away from work, I get to go to one of my twenty different kinds of workouts...or to the couch. Whichever! So event though I am SUPER excited that people like my designs and that my bathroom now has 3500 people who have Pinned it and are inspired by it - strange but true - I am not going to dive off the deep end to try and be something I am not. I am going to continue to dabble in this world of design and writing and love every minute of it. And who knows...I might just add a few other things to the list. Maybe it's time to start singing again. Speaking of that, I am singing a (tiny) solo in my son's elementary school choral concert today as part of a parent choir. I know...hysterical right? Even funnier is that I am singing "Man In The Mirror" by the one and only Michael Jackson. But I have to tell that singing with them these past few weeks was pure joy. So perhaps it's time to dabble in the music world friends. Who knows! For now, I am off to run and dream and plan and, you got it...DABBLE!!! Wanna join me? Ellen's New Design Show...A Sign of the (Decor) Times? If there was ever a sign that home decor is at an all time high in terms of public interest, then it's the fact that Ellen DeGeneres has a new furniture show premiering on HGTV later this month. HGTV!! A comedian turned talk show host and now furniture design expert??? 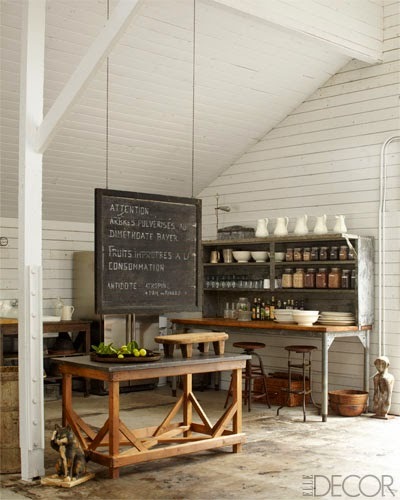 It may not be completely out of left field - home design and decor is not a new interest of Ellen's. She and her wife, fellow actress Portia De Rossi have long been known for their sense of style and their gorgeous homes. 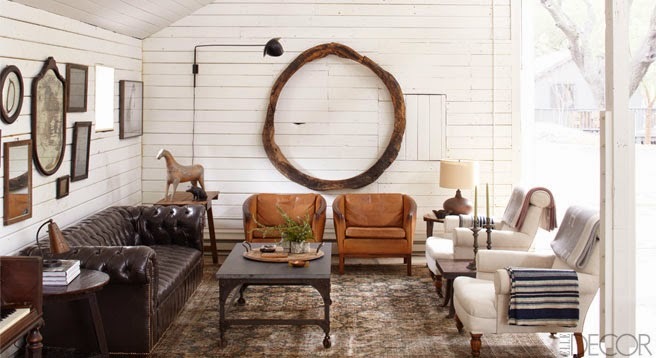 Here are a few shots from their horse farm in the Santa Monica mountains (courtesy of Elle Decor). 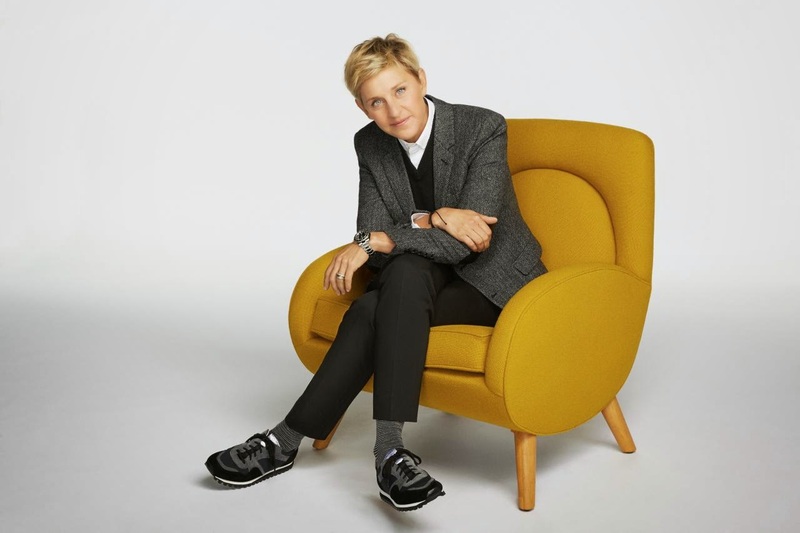 Ellen's new show will pit six furniture designers against each other in a series of contests where she will eliminate a designer each week leaving just one to win the $100,000 prize. While venturing outside of her comedic roots isn't something new for Ellen (American Idol anyone?) the fact that she is putting her name on a decor based show on HGTV is significant. It signals an ever increasing level of viewer interest in all things home design which as I have noted before, is big business these days. 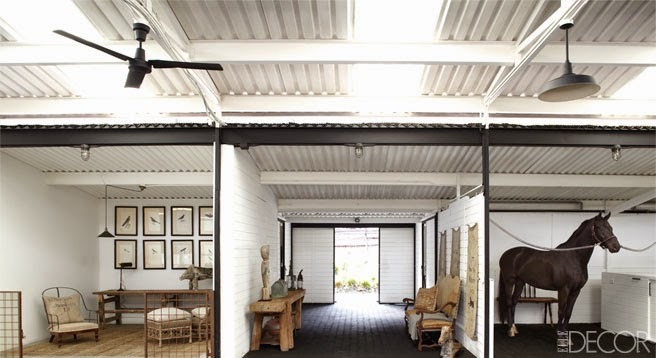 Need further proof of the trend of celebs dipping their toes into the lucrative tv world of home design? Rapper Common will premiere his new show called Framework on SpikeTV with a very similar format to Ellen's show where furniture designers and award a $100,000 prize as well. Add to Ellen and Common 80s icons Vanilla Ice and Jennie Garth along with hip hop legend Reverend Run who is documenting his home renovation. It's a bonafide home decor feeding frenzy! So what is behind the trend? One could argue that celebs have a lot of disposable income and love to spend it on their glamorous homes and a LOT of free time. But perhaps the bigger story here is an ever growing audience of people like me and the advertising and programming dollars that follow. In fact, in the third quarter of 2013, HGTV was the most watched cable network among viewers whose household income exceeded $100,000. A lucrative demographic, an almost incurable appetite for all things design AND main stream celebrities? Put them all together and you have a recipe for success! So who is next on the list of celebs with home decor shows? I vote for Ben Affleck and Jen Garner personally! How awesome would that be? A girl can dream no? It's been quite a month...and obviously not one that had me focusing on this blog. So sorry about that (again!). 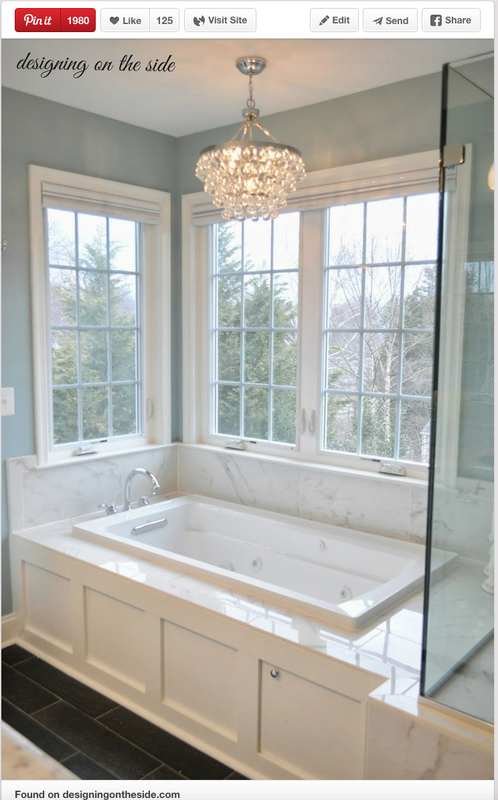 Luckily, thanks to this Pinterest pic of our master bath which has been re-pinned close to 2,000 times and is linked to this site, traffic to the blog has remained steady...a fact that amazes me. Thanks to those of you who have found our little DOTS blog. Hope you enjoy it and I promise to dive right back into now that the New Year is here. Speaking of New Year's, after a full month of holidays and houseguests, our home is suddenly very quiet and quite a mess! But as a friend recently posted, I am doing my best not to be sad it's over, but instead happy that it happened at all! Our "new" house was put to the test over Christmas with up to 10 people in it over the course of two weeks. I am proud to say that it held up well and gave everyone a place to be without being on top of each other which was a goal of ours when we renovated - so job well done us!!! Now that the distraction of the holidays and our birthdays and our anniversary and big work milestones have passed, I am in need of something else to focus on. I am one of those people that HATES the long, drab, dreary days of January and February. I don't mind snow, but the endless grey days depress me. And as much as I would love to hop on a Caribbean cruise, I am forced to stay here and send my children to school (stupid rules). After a little bit of soul searching today in the car (I am not very deep so it didn't take long), I realized that one thing that helps me feel happy is when I feel organized and clutter free. Not sure why this peps me up but for some reason it does. 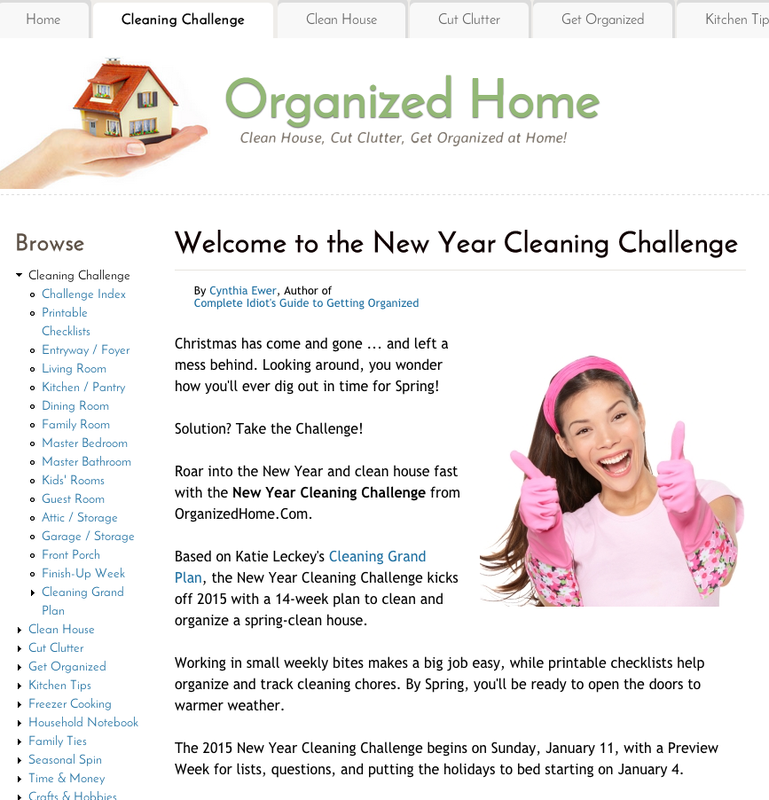 I recently came across an article on a New Year Cleaning Challenge. 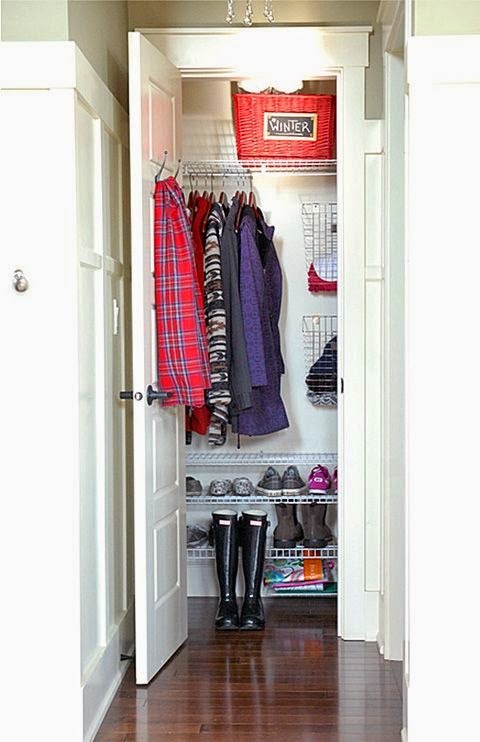 It's a 14 week challenge that helps you work through your entire house to get it ready for spring. I like the chick with the pink cleaning gloves. I bet she's never worn a pair in her life. 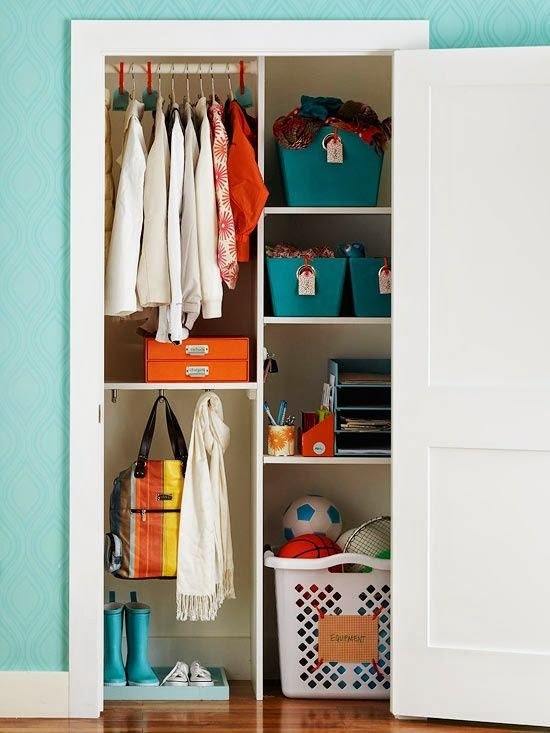 Anywhoo...this sounds a weeee bit intense for me BUT it does inspire me to give the house a good old fashion top to bottom decluttering (in my spare time!) The obvious place to start is with the Christmas decorations which are currently being dethroned. We went to the Container Store and got some fancy new ornament holders with the hope of reducing the number of random plastic bins that have taken over our attic. I also plan to go through all of our Christmas decorations and donate the things that never see the light of day. Sad as it is (and I can hear my mom giving these inanimate objects a squeaky voice that says "Don't get rid of meeee....") it just doesn't make sense to keep them. So off they'll go to Goodwill. Alright but back to the ugly task of un-decorating our house for now. One thing at a time! Happy New Year to all of you and may it be sunny and clean.